Here at Speck, we’re keeping ourselves entertained with a new favorite pastime! We’ve been putting FlapTop sleeve’s intuitive self-sealing closure to the test. We’ve been shaking it, turning it upside down, passing it to each other around the office (well it’s protective too! ), but we’re happy to find that no matter what we do the laptop always stays snug and secure inside this innovative laptop case. We think you’ll agree with us when we say you won’t find another protective laptop sleeve that has such an intuitive closure. We even have a patent pending on this one. FlapTop’s one-of-a-kind closure design features a responsive flex zone that allows you to quickly access and securely store your device, while protecting it from knocks and abrasions. No tricky zippers, no interfering magnets – just a safe and secure closure that seals itself seamlessly and stays safely sealed until you need your laptop again. Laptop protection doesn’t get easier or more reliable than FlapTop sleeve. On top of the clever closure, there’s FlapTop’s, unique to Speck, IMPACTIUM™ FOAM Shock Barrier. This lightweight and strong, shock-absorbent foam perimeter compresses on impact to absorb shock, making FlapTop sturdy enough to take all the rough and tumble we put it through! 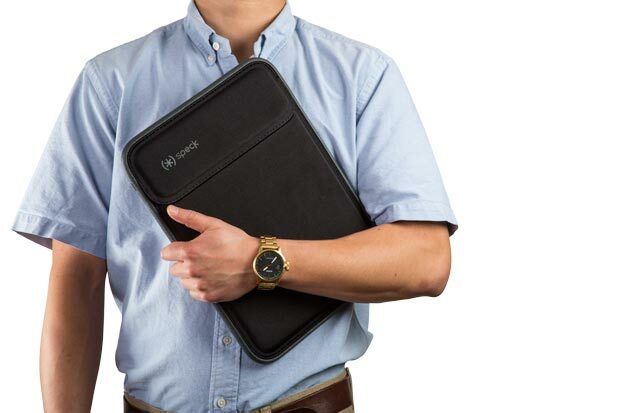 Also, the protective panels repel moisture and are easy to clean – being a water resistant laptop sleeve was certainly useful when it came to surviving coffee and water spills on its journey around the Speck offices! Go on, put it to the test! FlapTop Sleeve, Speck’s new innovative laptop case, is available now for MacBook 12”, MacBook Air 11” and 13”, MacBook Pro 13”, MacBook Pro with Retina Display 13” and MacBook Pro with Retina Display 15” and is coming soon for Microsoft Surface Pro 4. When will the Surface Pro 4 FlapTop will be available?